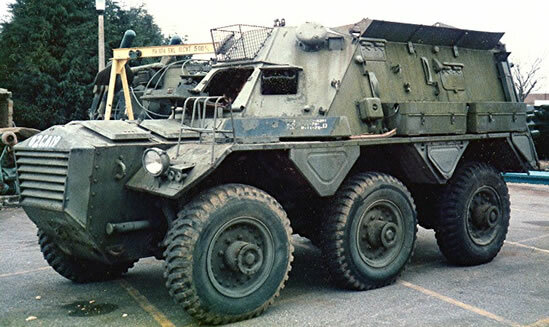 The Saracen was a member of the FV 600 family of wheeled vehicles that had entered development in 1948 that were destined to become the British Armies principal Armoured Personnel Carrier until its eventual being replaced by the tracked FV430 / FV432 family, which entered service in the mid 1960’s. First prototypes were completed in 1952 and entered service in 1953, with development and production completed by British firm Alvis. Armour – The vehicle was an all-welded steel construction with a maximum thickness of 16mm and offered the occupants protection against artillery shell splinters and small arms fire. It had no NBC protection. Mobility – The vehicle used a Rolls-Royce B80 Mk 6A 8-cylinder 170hp petrol engine. This gave a top road speed of 72km/h and range of 400km. Layout – The engine is located in the centre of the front of the vehicle, with the driver in the centre front, behind the engine. He has a fold down hatches for viewing out of. The vehicle commander was the troop commander as well. He sat on the left behind the driver and the radio operator to his right, both facing forward. Behind them was the troop section and two large exit doors in the rear of the vehicle. The first prototype produced was in 1948 and armed with a 2pdr (40mm) main gun designated the FV 601A. The 40mm was replaced soon after with a 76mm main gun, which was designated the FV 601B. Between 1952 to 1953, over 6 further prototypes were delivered to the British Army for trials. Further modifications to the turret were made and entered service in 1959 under the designation FV 601C AKA the Saladin Mk2. 1177 Saladin’s were built when production ended in 1972. It was eventually replaced by the CVR(T) Scorpion Tank, which also had a 76mm main gun. The commander was on the right hand side of the turret and the gunner on the left. They had roof hatches and escape hatches bellow the turret in each side of the hull. The vehicle had an additional coaxial 7.62mm MG and the commander had a 7.62mm MG on his pintle. First prototypes were completed in 1952 and entered service in 1953. Production ended in 1972, with a total of 1838 vehicles were built. A small MG turret similar to that fitted on the British Ferret Mk2 is located between the commander and radio operator. The turret mounts a 7.62mm MG and traverse is manual, not powered. The rear troop section seats a toal of 8 troops, who sit four a side facing inwards. They can access firing ports along the side of the vehicle and in the rear two doors. Mounted in the roof behind the turret in the troop section is a sliding hatch which gave access to a ring mounted 7.62mm MG that could be used in the AA role. The vehicle was not amphibious. Mk 1 Early version with 3-door turret and turret pistol ports. Mk 2 Modified Mark 1 with later two-door turret. The rear turret door folds down and can act as a seat for the commander. Mk 5 Mark 1 or Mark 2 vehicles modified with extra armour specifically for use in Northern Ireland. Mk 6 Mark 3 modified with extra armour as for the Mk 5 for use in Northern Ireland. Rear troop section is modified with map-boards and extra radios. This vehicle is a FV 604 that had additional armour raised roof, turret removed and the ring mounted 7.62mm MG moved to commanders forward hatch. It could also be fitted with Field Artillery Computer Equipment, AKA “FACE”. The rear troop section is modified to accommodate 10 walking wounded or three stretcher and a medic. 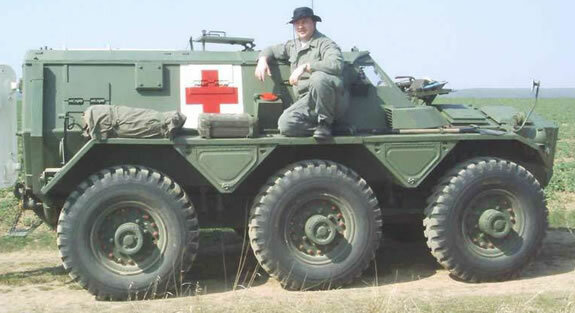 Nicknamed the ‘Stolly’ it shard many of the components and automotive parts of the FV 600 family and proved to be a highly mobile amphibious military supply truck that could carry 5 tonnes of stores, or tow 10 tonnes. The Stalwart’s impressive over-terrain capabilities came from the fact that the 6-wheel-drive system lacked differentials, using simple bevel gears to transmit drive. FV622 Stalwart Mk 2 General Service. This had a 2-man crew although a 3rd seat could be fitted to the right of the driver as a field modification. Could also carry 38 fully equipped troops or the Gloster SARO Bulk Refuelling Pack as alternatives to the 5 Ton cargo. The jet drive units in all the Mk 2 variants were much more efficient, giving a claimed 9 knots. The most obvious visible difference is that the lower edges of the cab windows were now angled downwards rather than horizontal. This was to improve visibility at close-range, particularly when being marshalled by a banks man standing nearby. FV623 Stalwart Mk 2 Limber. An artillery ammunition supply vehicle. Extra seat in cab for crane operator plus 4 extra seats, and an ATLAS 3001/66 hydraulic crane was added to the cargo area. 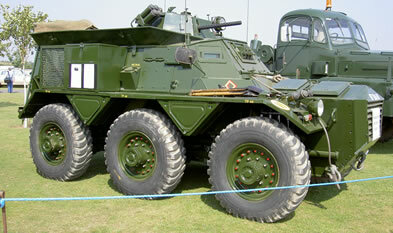 FV624 REME fitter’s vehicle, based on the Mk 2 Stalwart. Two extra seats were added and a different crane from the FV623 variant. The Saladin was used by B sqn 16/5 Lancers during their defence of Nicosia airport in 1974 and subsequent armed recce operations under the banner of the UN. It also fought in the defence of Kuwait City during the 1991 Gulf War where they reportedly destroyed several Russian T-55 tanks fielded no the Iraqi Army.